This cauliflower scramble or gobhi ki bhurji makes a healthy and delicious side or a savory breakfast. Unlike most vegan scrambles that use tofu, this one is made with cauliflower! Simple & delicious Cauliflower scramble is a great side to a meal or a savory breakfast idea! 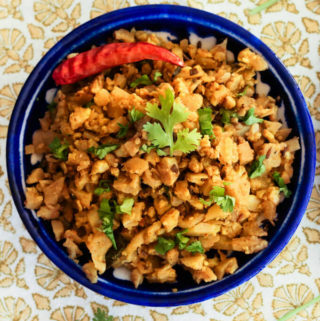 The word “bhurji” in Hindi is used for all dry preparations where the main vegetable is finely chopped (like with cauliflower) or crumbled (like with cottage cheese/ paneer or tofu) or scrambled (like with eggs) . The recipe is super simple with just 3 main ingredients — cauliflower, oil, and spices. Finely chopped cauliflower is lightly sautéed in oil with aromatic spices. Easy, delicious, and ready in just 20 mins. 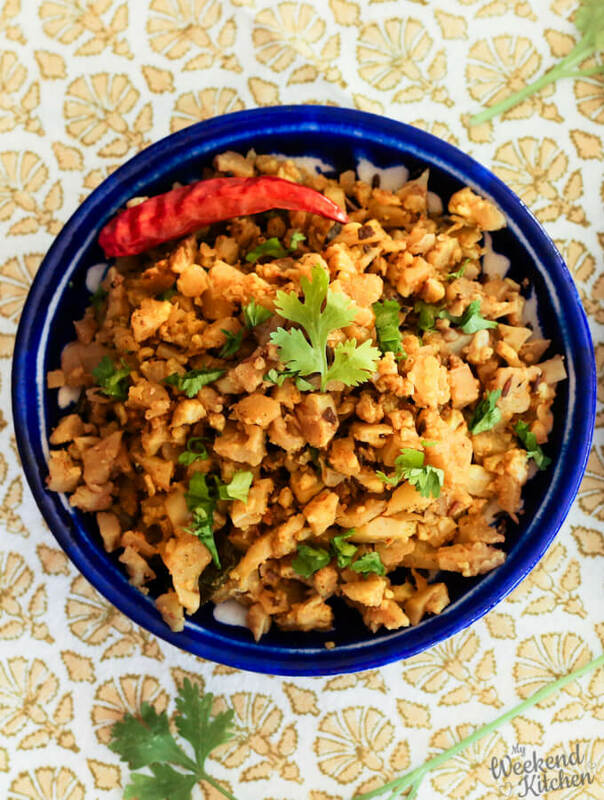 In this recipe, I use mustard seeds, dry red chilies, and curry leaves to give this cauliflower scramble a very Indian flavor. How to identify fresh cauliflower? look for a compact head! 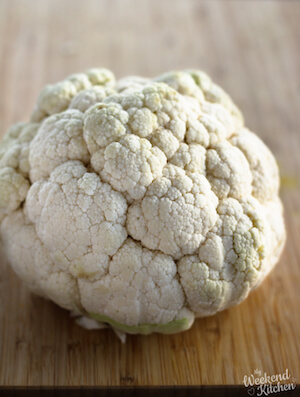 While buying, look for cauliflower that has a creamy white color and compact head with densely packed florets. The florets should be free of blemishes, browning, or any wet spots. Also check for fresh green leaves. Avoid any cauliflower where the florets are all spread out. Slight bruising is fine but avoid if it has brown or blackened marks. They are signs of old cauliflower. Sometimes vendors may chip off the marks so be careful to look closely. Cauliflower is a highly nutritious vegetable. It is a good source of fiber, antioxidants, vitamins, and minerals like manganese, potassium, Vitamin C, and K.
Fights cancer: Cauliflower belongs to cruciferous vegetables family. This family of vegetables is rich in fibre, anti-oxidants, and they have high cancer-fighting properties and anti-inflammatory properties. Helps in weight loss: Cauliflower has low calories, almost zero fat, high fiber, and high water content. You can eat a lot of cauliflower without gaining much weight and also feel full for longer. Better digestive system: Cauliflower is a good source of fiber which helps maintain a healthy gut and overall digestive health. 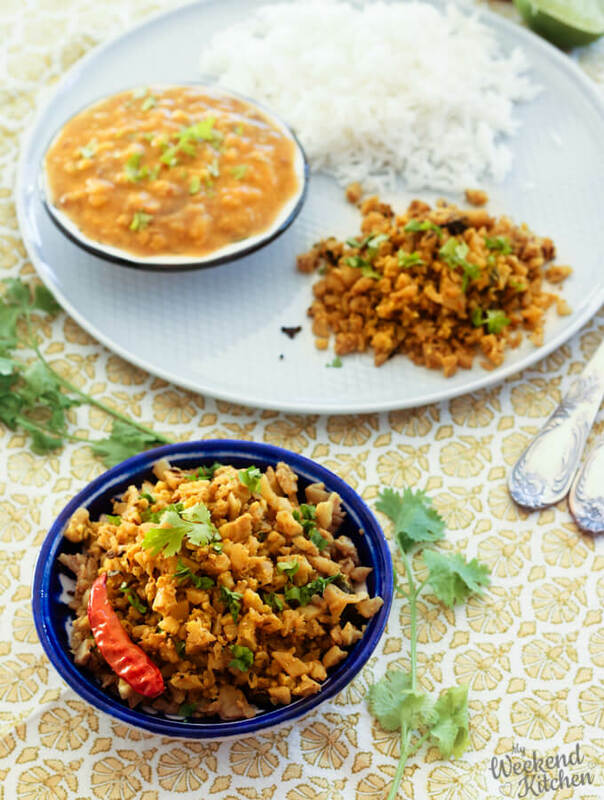 Gobhi ki bhurji is a popular side dish in Indian meals served along with a curry with rice or flatbread. That is also the reason why the traditional recipe has a lot of spices. When making this cauliflower scramble recipe for breakfast, you may only use turmeric, salt and pepper and it will make a light breakfast scramble. You can also add more vegetables like finely chopped onions, tomato, and carrots to the recipe. But I like it simple, just like this. This cauliflower scramble or gobhi ki bhurji makes a healthy and delicious side or a savory breakfast. Easy, delicious, and ready in just 20 mins. In this recipe, I use mustard seeds, dry red chilies, and curry leaves to give this cauliflower scramble a very Indian flavor. Bring around 4-5 cups of water to boil. Add a little salt to the boiled water. Place the cauliflower florets in the boiled water. Cover and let it boil in the water for 5 mins. This helps remove any dirt that might have stuck inside the florets. Drain in a colander and let the cauliflower air dry. Finely chop the florets with the soft stem. Heat oil in a pan on medium heat. Once the oil is hot, temper with asafoetida, mustard seeds, dried chilies, curry leaves, and grated ginger. Gently sauté for half a minute so that the spices infuse the oil. Add the chopped cauliflower. Toss and mix well. Cover and cook on low flame for about 5 minutes. Check and stir in between to ensure that the cauliflower is not sticking to bottom of the pan. Add turmeric, red chili powder, garam masala, and salt. Mix well and cook covered for another 5 minutes till the cauliflower is soft and well cooked. Garnish with fresh coriander and serve hot with rice and dal fry. For a stronger flavor, use mustard oil instead of Olive oil. Nutritional Information is the approximate information for 1 serving. If you try this recipe or if you have more healthy cauliflower recipes to share, I would really love to know. 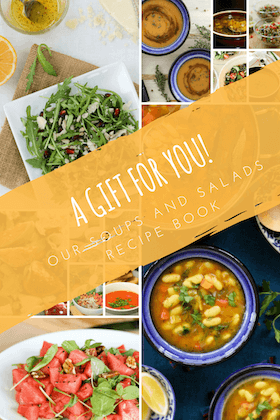 Tag your picture with #weekendkitchen on instagram or connect with me on Facebook, Twitter, Google+, and/or Pinterest. Or join our newest journey into Recipe Videos.